Democratic women running for office in northern Virginia picked up wins Tuesday night in several House district races. Female candidates got nods from primary voters in Districts 1, 7 and 10. The victories continue record-breaking participation from female candidates this year in Virginia's contests and around the country. 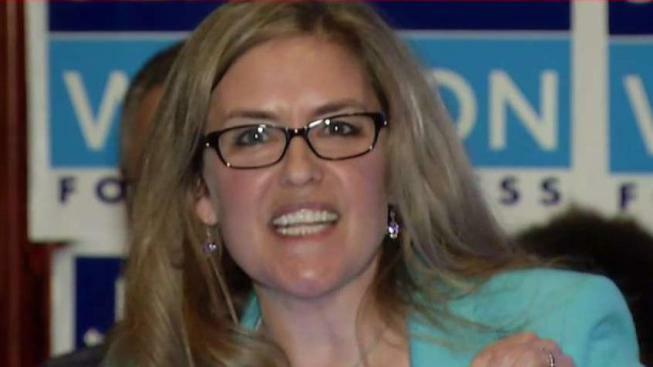 In the 10th Congressional District, Democratic state Sen. Jennifer Wexton beat out five opponents, including three women, to advance to a general election against Republican Rep. Barbara Comstock. The incumbent won her primary, beating Republican challenger Shak Hill by roughly 10,000 votes. Introduced by Democratic Sen. Tim Kaine, Wexton told a crowd Tuesday during her victory party she would set a positive, progressive agenda if elected. “Together we will get back to appealing to people’s best instincts, not their worst," she said. "We will get back to a place where women, minorities immigrants the LGBT community and all people feel safe in our country." After she spoke, Wexton shook hands and posed for photos with supporters. During one picture, a woman cheered “girl power” as the shutter snapped. The district is key for Democrats, because Comstock is considered one of the most vulnerable incumbents in Congress. Hillary Clinton won the district by 10 percentage points, and Democratic Gov. Ralph Northam won by 11. But Comstock easily beat a Democrat in 2016 and has often been critical of Trump. Voters also cast ballots in the Democratic primary for the 7th Congressional District, where former CIA officer Abigail Spanberger defeated Dan Ward, a farmer and former Marine. The first-time candidate will bring her unique background into the November race against incumbent Republican Dave Brat. Robert Monroe, 53, a video producer, said he voted for Spanberger because he believes she has a better chance of defeating Brat. "To be honest with you, I voted for her because she is a woman," he said. "To defeat Dave Brat, I think we need to energize the voters, particularly the female voters. I think she will energize that voting bloc, which we need to defeat Dave Brat." In the House District 1 seat, government contractor Vangie Williams was selected by voters to face incumbent Republican Rob Wittman for his seat in November. Williams was the only woman in the race, defeating Edwin Santana, a second generation Puerto Rican who is a Marine Corps officer, and John Suddarth, who owns a commercial real estate company and attended West Point.